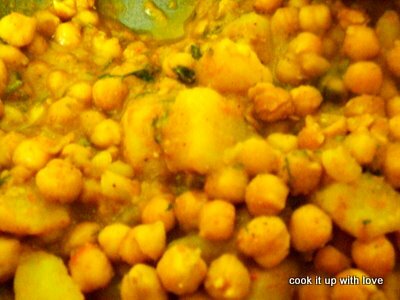 Here is a really easy recipe for making a gravy with channa and potatoes, a great side dish for Rotis and Puris. 2 Cups Kabuli Channa soaked for around 10-12 hours. Boil the soaked channa in a pressure cooker for around 15-20 minutes. Make sure the channa is soft, but not over cooked. Boil the potatoes. Set aside. Make a paste out of onion and tomatoes. In a pan heat some oil, add ginger garlic paste and fry for a while. Add the onion-tomato paste, and saute well for around 3-4 minutes. Add salt, dhania powder, jeera powder, channa masala and mix well. Now add the boiled channa and the potatoes. Mix well. Serve hot after topping with chopped coriander leaves. This entry was posted in Great Gravies, Lunch box ideas, Quick Bites, Vegan . Bookmark the permalink.